iPads are everywhere. They are generally popular, and for many children, iPads aren’t just used as toys but as learning tools in schools as well. Families of children with autism seem particularly drawn to owning iPads. Why are they so popular? And how are they helpful for people with autism? People with autism often have difficulties learning and communicating, because of the way autism affects how they develop and experience the world. For example, people with ASD can be more inclined to process images visually. Many are delayed in learning to speak, or don’t speak at all. As young children, they may be slower to understand the meaning of symbols as communication. And they often have difficulties connecting with others in social relationships. Sensory and information processing differences can make it hard to keep one’s attention on specific things, or to keep up with quick-moving conversations or activities. That doesn’t mean they can’t learn. Everyone has the potential to learn and grow. People with autism also have many strengths and can flourish with the right opportunities and supports. Learning is based on the ability to understand and communicate ideas. The foundation of communication is social connection. So before we start setting goals, we need to understand where a child is at as a communicator. That doesn’t mean we ever exclude children from learning opportunities because we think they “aren’t ready.” Instead, we think about how a tool or an activity might be helpful for their learning right now, and then make sure we create opportunities for them to participate in ways that are meaningful and rewarding for them. For example, if a child is not yet focusing on a book (or a toy, or a picture) together with a reading partner, that’s the place to start. Research on how iPads can and should be used to support learning is really just beginning. But it seems obvious that iPads are helpful as a learning tool. 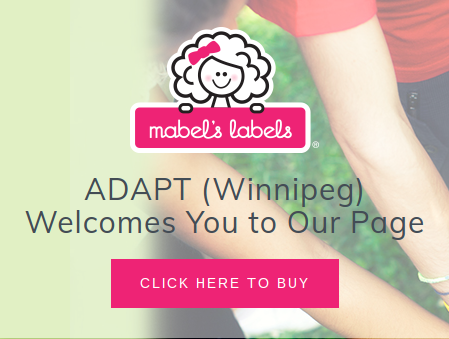 They are reasonably affordable and also popular, taking away the stigma of having a communication device. They are portable and move well between home and school. The iPad has the greatest variety of apps compared to other tablets. iPads are appealing and fun, and they can provide many different ways to communicate and learn: email, a typing program, social media, videos, images, graphic organizers… there are many apps dedicated to making it easier to understand and share ideas. iPads are also adjustable for accessibility. You can use colour filters and adjust text size and contrast, use switch hardware or adjust the touch controls for people with movement challenges, have the iPad read anything to you (and follow along as words or sentences are highlighted), or have it write what you speak. If you’re typing, the iPad can make word suggestions or read to you as you type. In short, the iPad has many options that can play to the strengths and the needs of people with autism. The most researched application for iPads is to use them as an AAC (augmentative and alternative communication) system. Apps like Proloquo2Go give children or adults a flexible system for them to create messages and “speak” them aloud. Time and effort are required, first for the adults to learn how to use the system, then to teach the child. An AAC system has to be available and in use for a good part of the child’s day in order for them to become independent communicators. Consider how much time it takes for toddlers to learn to speak, or for anyone to learn a new language…it isn’t much different for language learning at any age. But as for any language learner, the impact is enormous. What about using the iPad as a learning tool in other ways, or for children who can speak but may have other challenges? In addition to AAC, iPads offer many opportunities for communication and learning support. Although research on the use of iPads for learning for kids with ASD is just beginning, a review of research on supporting writing for kids with ASD is enlightening. That 2016 review found 20 studies supporting technology-aided instruction for things like communication, spelling, composition, and work-related skills. Other evidence-based practices included teaching self-management, using visual supports, and learning together with peers – all things that an iPad can make easier. Consider the unique child, and what would be helpful for them. Each child’s sensory profile, behavior, interests, and stage of development is different. 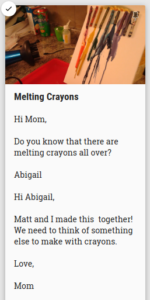 “Speech to text” works really well for a child who can speak, but has trouble with writing. “Text to speech” is helpful for a child who can’t verbalize their thoughts. If a child’s vision is normal and they aren’t over-sensitized to visual stimulation, we probably don’t need to worry about adapting the way a device displays information….and so on. We have to choose and adjust the tool to fit the child, and not the other way around. Think first about what might be an obstacle to learning for a child, and then think about ways an iPad (or any other support) can help work around that. Don’t look at the iPad as a teacher replacement or a babysitter. It can be a tool to support learning together. Children naturally interact with each other as they explore technology, just as they do during play with toys. Open-ended apps like Toca Boca’s collection can be a gateway to social-dramatic play, as children can move characters, manipulate objects, and narrate and record stories. The frame provided by the app gives children ideas about what activities might be a part of pretending to be at the beach, or in a store or a hair salon, and they can then be given opportunities to try it out with real toys. Children might also explore apps together that explain concepts in science and social studies, before or after doing real-world learning activities like science experiments and field trips. If a child knows how to type, ordinary apps that everyone uses can become a support for interaction and collaboration. Gmail and Google Keep provide an opportunity to practice sending notes and responding to the thoughts of others. Google Docs and Slides allow many users to work on the same document at the same time, providing both modeling and a mode of communication that is simpler for someone who struggles with social interaction. Video modeling is a well-researched way to teach social routines, and to spotlight behaviors we hope children will keep using. Photos and videos are also great for supporting joint attention, reminiscing together and talking about family stories. iPad learning apps are much better than a textbook, as they can provide multi-sensory ways to take in information and explore the world in a way that no textbook never can. It provides more personalized, adjustable ways to practice skills, memorize facts, and ask or answer questions. 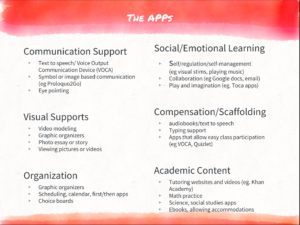 iPad apps also provide many tools for organizing ideas and presenting learning in appealing and engaging ways. They can be used to help kids manage their time and plan ahead – think of calendars, first-then planners, and graphic organizers. Concerns have been raised about children and the overuse of screens. This is a valid concern – there is no substitute for real-world social connection and learning. As with everything else, we have to assess each child’s situation and needs to find that balance. If a child is using an iPad for an AAC device, it needs to be with them all the time. But often, then, we don’t add recreational apps to the same iPad, to encourage the child to use the device as it is intended. If we are using an iPad as a learning tool, we probably do want to set limits to make sure the child is engaging in varied activities throughout the day. However, it is shortsighted to let our fear of overuse limit the usefulness of a tool that can remove barriers and foster learning. My son had his first experience with an iPad when he was three. He’s part of the first generation to grow up with this device. We definitely have had concerns about overuse. And we also have seen how using an iPad helped him grow in literacy and world knowledge, and how an iPad can provide activities that spark communication and mutual enjoyment. Want some specific app suggestions? Click to keep reading. Thanks to Julie Oyande and Paramvir Dandiwal, fellow graduate students in inclusive education at the University of Manitoba who contributed to this article. Astro-Saddler, K. (2016). Using evidence-based practices to teach writing to children with autism spectrum disorders. Preventing School Failure, 60 (1), 79-85. Boyd, T, Hart Barnett, J, & More, C. (2015). Evaluating iPad technology for enhancing communication skills of children with autism spectrum disorders. Intervention in School and Clinic, 51 (1), 19-27. Kaderavek, J. & Rabidoux, P. (2004). Interactive to independent literacy: A model for designing literacy goals for children with atypical communication. Reading & Writing Quarterly, 20 (3), 237-260. Withey, K. (2017). Using apps to develop social skills in children with autism spectrum disorder. Intervention in School and Clinic, 52 (4), 250-255.